No matter how tough a zombie appears, they can't defeat gravity. And gravity could save your life in a zombie fight. In other words you get the zombie unbalanced, and let gravity smack them to the ground. Once on the ground the zombie's fighting ability is restricted. They may also be stunned from the fall and you will have time before the zombie can get to it's feet again. So when the zombie is down, you can destroy it or run away. But first you need to know how to take a zombie down. 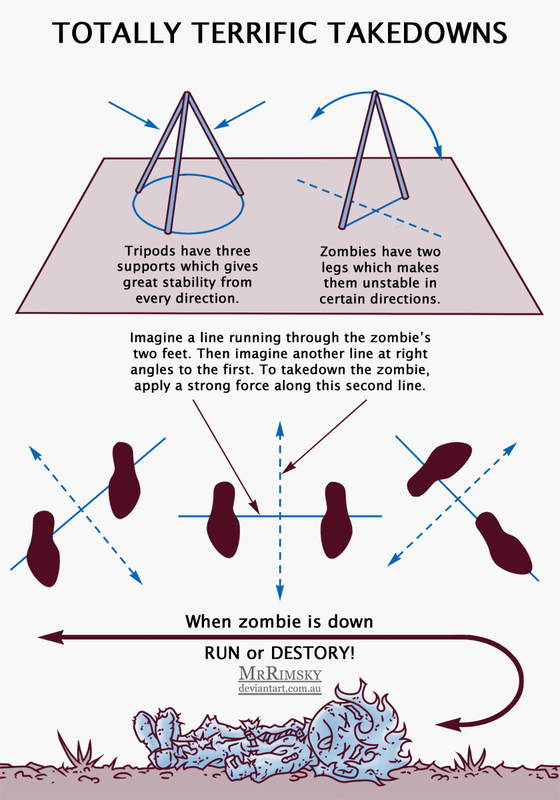 It is important you apply a force in the direction the zombie is most unstable. Next week we will examine the different techniques you can use to apply this force.